The two pictures below that got me messaging him frantically for the recipe... he duly obliged and once I made this recipe, I totally knew why he was raving about it. This is an Addie's own recipe, just tweaked very little by yours truly. I actually have a traditional clay pot that my grandma used to cook curries in, and its got a rounded bottom, so I have a wok ring that worked as my diffuser. The clay pot worked perfectly as the perfect heat conductor and I covered it with foil which allowed the pulao to steam, like traditional pulaos should. Addie recommends making this in a Le Creuset or a similar heavy based pot. If you don't have a cast iron pot and have a gas range, you can diffuse the heat by using a heavy gauge frying pan with water on which the pot sites, like Addie has done in the above picture. 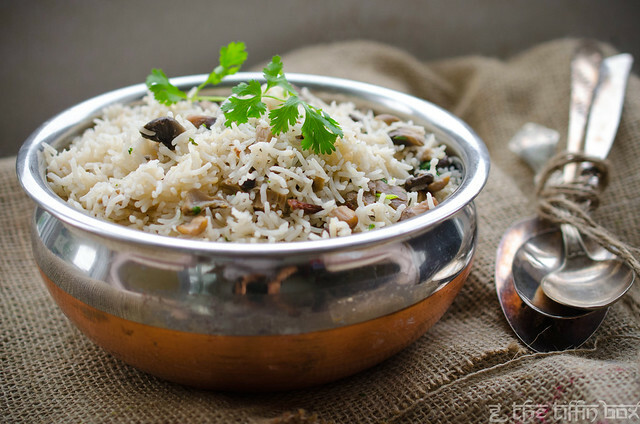 Addie recommends serving this pulao with a simple masala dal and pickles, as stronger curries might mask its delicate flavours. 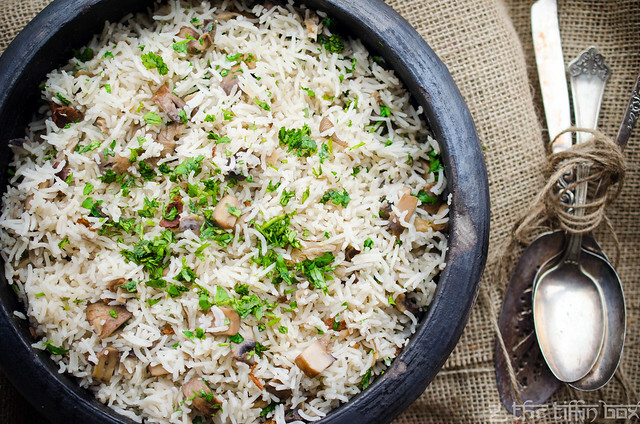 'Choose your favorite flavorful mushroom for this recipe. While criminis give a fairly strong earthiness, using a more potent mushroom like porcini would lead to fabulous results. Might be fun to try using dried mushrooms (note: I did). In this case, I would use the water used to soak the mushrooms too (note: did this too). Traditional handi pulaos and biryanis work on the principle of low heat and completely covered cooking, so as to keep all the flavors intact. It requires a relatively high specific heat capacity and heat transfer at constant temperature. A cast iron (Le Creuset pan) is the best, if you own one. I followed the method faithfully, and whichever way you make it, you are guaranteed a pulao that just tastes out of this world. Earthiness from the fresh and dried mushrooms, balanced with sweet, fragrant roasted garlic, chunks of mushrooms, and the fresh flavour of chopped cilantro. This makes a simple pulao extraordinary, and I have to thank my dear mate for sharing it with me. Wash and soak the basmati rice in cold water for an hour. Drain, reserving 1.5 cups of the soaking water. Heat the oil in a heavy based pot, and on a low heat, place the sliced half head of garlic, cut side down. Leave the garlic, gently sizzling, for about 10 - 15 minutes, until it is golden, roasted and sweet. Take out the garlic, leaving behind the delicious, garlic infused oil, and let cool. When cool, squeeze out the flesh, and coarsely crush with the back of a knife. Keep aside. Add the chopped crimini and re-hydrated dried mushrooms to the oil, along with the salt and sweat for a few minutes. Add the drained rice and crushed garlic to the pot, and saute for a minute. Add the reserved rice soaking water and the mushroom water (the total amount of water should measure 3 cups) and bring to the boil. Turn the heat down to its lowest setting, cover the pot tightly with aluminum foil and let the rice steam, undisturbed for 20 minutes. After 20 minutes, take the pot off the heat, leaving it covered and let the rice sit for another 5 minutes. Open the foil, carefully, and fluff the pulao with a fork. Garnish with fresh cilantro and serve with a simple masala dal and pickle. How could I not... its fantastic!! Love the inspiration behind this recipe Michelle! It sounds as good as it looks!! Nice one :) Beautifully pictured!